The stiffness and damping seen on the TVC-33S are exceptional, and in line with what we expect given our experience with other RRS models. The combination of large diameter tubes, and relatively short height for a 3 series tripod make for a very stiff tripod. The stiffness and damping data are the averages of 10 trials for each measurement. The reported error is the standard error, except in the case of the damping data. I have set the error in the damping at 10% as the standard error metric does not appropriately capture the error in fitting to the data. All of the reported specifications are measured, with the exception of the weight rating. The tripod is measured at full height, with the center column (if applicable) down. The RRS TVC-33S is tested with the set screws in the top plate fully locked down onto the camera bar. This rigidly secures the bar to the tripod and increases the stiffness, but does significantly reduce the amount of damping that the tripod exhibits. This is because the majority of the damping action happens in the rubberized top plate. Using the set screws effectively bypasses this piece of rubber. I do this because it maximized the stiffness results for the tripod, which is my primary basis for comparison between tripods. For consistency, engaging the set screws is standard procedure for these tests. We get over three times as much damping, but the stiffness is dramatically reduced. For large telephoto lenses, this is probably a worthwhile trade off. For all other situations though, the stiffness is king, and the already high damping of 0.8 Js is more than adequate. 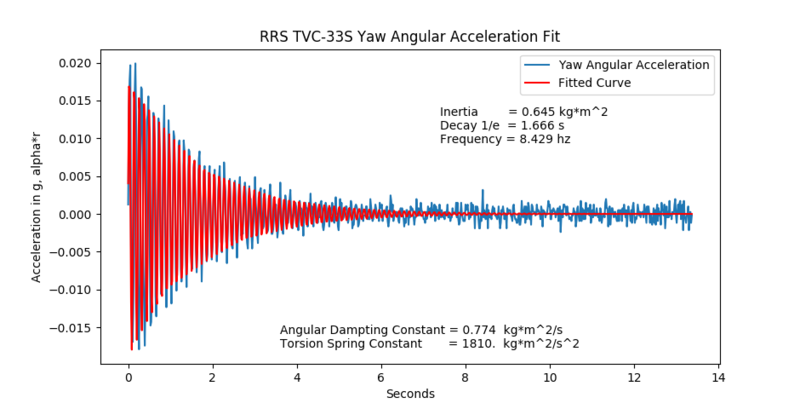 The following data is example raw data from the stiffness and damping measurements. The relevant information with regards to the tripod performance is entirely contained within the stiffness and damping figures presented above. The plots below are solely present so that the tested stiffness and damping figures are believed. Each plot and the corresponding Fourier frequency space plot correspond to one of the ten trials done on each axis to obtain the test results. For a more in depth discussion on the meaning of these graphs, see the methodology section and the understanding the test results page. 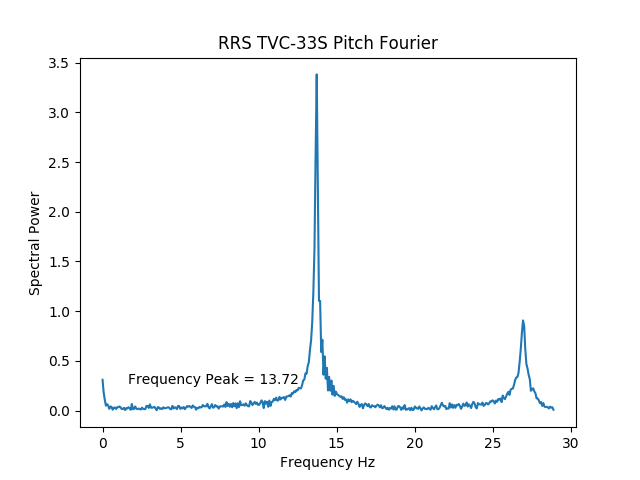 This is a very clean set of data, and shows the excellent stiffness and damping performance of the TVC-33S. Again, very clean. 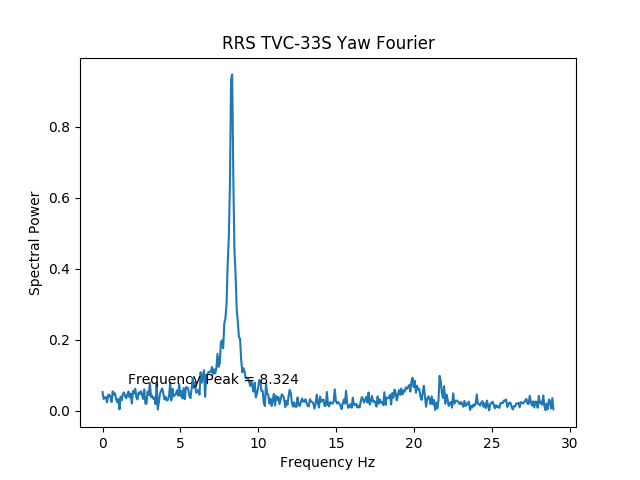 The spike on the far right of the plot is actually the resonance of the bar used in taking the measurements. It doesn’t normally show up because I don’t normally have to use this much weight to get good data. With a tripod as stiff as the TVC-33S though, a lot of inertial is required to actually take meaningful data. So we get a treat here.